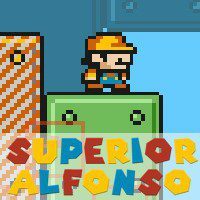 You are going to play super alfonso and face challenging levels. Get bonuses and reach the finish in time. Take control of your incredible character and lead him through challenging levels. You must hit boxes for coins and bonuses to be able to complete tests ahead. Do everything in time!